Batman and his gang of heroes head into space looking for Brother Eye. Batman encourages the new Blue Beetle to use the scarab to reveal the satellite. He negates its vibration, and suddenly Brother Eye appears before them. As soon as it appears swarms of OMACs attack the ship. On Earth-Two, Superman consoles his Earth-2 counterpart. Diana appears and says they need to learn from their mistakes. They then decide to get back to Earth to stop it, but they don't know which Earth is theirs. Across the multiverse, heroes struggle against the chaos. Alex Luthor grabs two of the Earths and crushes them together, forming a new merged Earth. From atop his tower he watches the results of his experiments with Earths. When his combination fails to produce his perfect world, he crushes the new Earth, killing everyone on it. The mystical heroes come together at Stonehenge to summon the Spectre in hopes of stopping the crisis. Zatanna commands him to appear, and suddenly Cris Allen materializes. He screams before transforming into the Spectre. The Spectre then focuses on Star Sapphire, and screams that vengeance must be had as she explodes. Nightwing and Superboy arrive at Alex's tower right as Wonder Girl joins them. They charge in and knock Psycho Pirate away as Alex turns to attack. In space, the Green Lanterns shield the ship as they charge in to attack Brother Eye. Crashing into the satellite, Batman's strike force charges inside. Inside, Black Lightning is subdued but Mr. Terrific continues on, his ability to be invisible to technology serving him well. Superboy continues his assault on the tower as Alex combines Earths Two and Three. 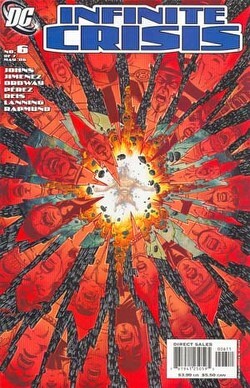 The Supermen and Diana writhe in pain as they are merged with their counterparts from Earth-Three. Donna Troy sees this as the moment that she must act, and directs her group of heroes to attack Alex's hands. They succeed in blowing Alex's finger off and back on the tower he screams in pain. The resulting explosion in space causes a number of the heroes to vanish, and the interruption frees Superman and Wonder Woman from the merging. Nightwing knocks Alex down off the tower and he stands up to find Power Girl and the other tower captives free and bearing down on him. Superboy completes the job by freeing Black Adam from his bonds. Psycho Pirate tries to use his power on Adam, but he responds by putting his hand through Psycho Pirate's head, instantly killing him. They appear to be making progress when, with a blur, Superboy-Prime joins the battle. Black Adam rains blows down on him, but Superboy-Prime just laughs and knocks Adam away, causing him to transport to Earth-S. Superboy-Prime demands that Alex finds Earth-Prime and bring it back, but is interrupted when Martian Manhunter and the other heroes attack him. Superboy-Prime lashes out and pushes them away, sending all of them except J'onn back to their Earths. In space, Batman reaches the core of Brother Eye and talks with his creation. The satellite shows him images of Nightwing fighting at the tower, trying to distract him from his task. Superboy-Prime turns his attention to Nightwing, telling him that he wasn't even trying last time he took on the Titans. From behind, Superboy grabs Prime and tells him that he wasn't trying either. On the satellite, Batman explains that he isn't trying to delete Brother Eye, he's just distracting him while Mr. Terrific activates the thrusters. This will push the satellite out of orbit and send it crashing to Earth. It tries to capture Batman, but Green Lantern flies in and rescues the Dark Knight. Batman commands Jordan to fly them to Alex's tower. Superboy-Prime beats Wonder Girl as Alex finally locates Earth-Prime and reaches towards us. As Superboy-Prime knocks Wonder Girl away, Superboy strikes back. Prime yells that he'll be the true Superboy again, but Connor grabs him and rushes towards the tower. Crashing straight through, the tower explodes, sending everyone flying. With the tower gone, the multiverse collapses in to one singular planet. New Earth. Wonder Girl and Nightwing tear through the wreckage, looking for Conner. She finally finds him. She tells him that he saved everyone, and he responds that he knows. That is all he can say as he succumbs to his injuries and Superboy dies. Superman, Batman, and Wonder Woman arrive just in time to watch as Wonder Girl cries over Superboy's body. Nick: Story - 4: A four? Why would I ever give this great issue anything less than a five? The main answer is that I felt there was just too much going on in this issue, that it detracted from the story. However, my real reason is that I refuse to give absolute praise for the killing of Connor. I simply cannot condone that move, regardless of any popular theories about his future. That aside, this was really a great issue. Batman's attack on Brother Eye was a very nice scene, mainly because it spotlighted why someone like Batman belongs on the Justice League. He is a fantastic leader. Spectre's appearance on the other hand, just felt forced. I really liked his last appearance in Infinite Crisis, but this was a little too much. Spectre is getting a miniseries; they easily could have left this for then and had a few more pages to spend on the Superboy fight, which was easily the best part of the issue (more on that later). Apart from that fight, two moments really stood out that made this story great to me. The first was Black Adam's execution of Psycho Pirate. I've seen people online complaining about the graphic nature of his death, but I loved it. Maybe there's something wrong with me, but it was really cool. The other nice touch was Alex reaching through the 'fourth wall' towards us on Earth Prime. The Superboy fight though. I need to mention just how cool that was. I may not like his death, but at least he went out fighting. The comment that he wasn't trying either was fantastic. Superboy fought the good fight, and he saved the planet. You've got to respect that. The only other point I feel the need to comment on is the creation of 'New Earth'. I'm not going to lie, I'm worried about what this might mean for the DCU, but I'm not going to jump to any conclusions until I see what this really means for us. Overall, another great issue of Infinite Crisis, but I still feel like there was just too much crammed into this issue. And Geoff, WHY DID YOU HAVE TO KILL CONNER? Neal: Story - 5: Beginning to end, still one of the best series of comics that I've ever read. The only dip in the whole story so far is the Superman vs. Superman fight, and beyond that, every single scene in every single one of these comics has had a character purpose, has sought a specific and complex goal, and brought everything one would desire from an epic. This is an event, where other events have failed. In an average comic, you call it a good issue if there is one scene like a single two page spread has been in Infinite Crisis. This is the first book that, even before it's finished, I would consider paying the exorbitant extortion that they charge for a hardcover. I much prefer the calm before the storm at the start of this issue. Whistling "Take Me Out to the Ballgame" while on the way to save the world shows me two things. First off, anyone who critiques this group of heroes as reluctant has yet to discount the scenes like this, where saving the world is a matter of course, a requirement, a certainty. Secondly, if Superboy wants to see a sad universe filled with heroes that are begrudging toward the fact that they're heroes, destroy Earth-Marvel. And not to say that I don't like Marvel, I like Marvel, but you won't ever catch even Captain America whistling "Take Me Out to the Ballgame" on the way to fight the Kree. I like how Booster already calls the new Beetle "Blue". A few issues back, I was dubious about the new Beetle, but looking at the new first issue, and seeing his necessity as of this script, I'm enjoying him. The costume is also growing on me, as is the deeper aspects of how he became who he is, and his relation to Green Lanterns. It's interesting, at very least. When Batman approaches the satellite, I'm curious as to why Brother Eye started spilling the beans to him, but then, it's not without precedent. He's been calling on Batman to gloat for a while now. It's kind of like what Brainiac does, so certain that he's ironed out any potentiality of failure that he monologues. I can dig it. You also, in this issue, see something that I've missed for some time. Batman in a strong, firm, leadership role instead of as the black sheep of the club. He even one-ups Green Arrow, who comes along for the ride essentially to get dissed by Batman. Batman tells people what to do, and they do it. It gets the job done. This is why, in retrospect, thinking about it, I think Batman should lead the JLA. I think Superman is the heart of the team, and he's not a dumb guy (he's a near match for Batman in terms of handling a situation), but Batman just seems like the natural leader. He doesn't like to be seen, he works best at making plots and executing them, and dealing with menaces. This issue shows that superbly. Superman and Earth-2 Superman don't have too much characterization in this issue, but what there is proves incredible, from the "If we're alike beyond the suit, I know how much Lois meant to you." to "We have a job to do." Both are epic moments. The page with all of the alternate Earths was a fanboy dream. Bizarro Earth, Earths we've never seen or heard of, all crazy, rampant riffs on our current Earth. It's what makes me yearn for them to restore the infinite Earths, even though I doubt they will. It's just really incredible to see all this potentiality. But then, there's the worry that I've had for this series, and the entire idea of events, that makes me glad they're not opening that can. Jeph Loeb has a very good attitude about story devices, and also a critical flaw with them. For instance, he'll open up a TON of potentiality, but not follow through with it, totally. There is a lot of merit to this. For instance, he brought about multiple colored Kryptonite in the universe, but he's leaving it mostly for other writers to explore. Same with Krypto, Supergirl, Luthor as a rogue instead of reputable businessman, and on. I believe he said that he was helping to create a larger sandbox. The downside is when people never take that sandbox and work with it. A critical example of when this fails is Birthright. A few times, Birthright has popped up in continuity in vague reference, but largely, it's token continuity and not die-hard, unchallengeable history. The upside is something like Infinite Crisis, where Geoff Johns will change things, and then remember it, and follow through. Batman and Green Lantern hate each other in Rebirth, so in Green Lantern they make amends, and eventually Jordan is redeemed by saving Batman from Brother Eye in this issue. He changes Superman in ways, he doesn't leave it (like Birthright), he follows it through with a story like "Up, Up, and Away", much like early Byrne, only much more universe-spanning and continuity inspired. He changes Flash, he finishes the storyline. Much like with Wonder Woman and Rucka. A natural arc, completion, and then a rebirth. That' s GOOD cyclical writing, and this Infinite Crisis is the culmination of four years of work on the part of DC to make an epic story. Will it survive afterwards? Who knows, but I do know that there is at least a marked, concerted continuity effort at work here. Alex is pretty creepy. Mostly because he believes he's so right, and yet, he smashes two Earths together, destroying them, and crushes one in his fingers without regard. He's evil, but he thinks he's doing the right thing. It's chilling. And Psycho Pirate, hoo boy. I mean, what a CHUMP. You'd think he 'd learn after the Anti-Monitor, right? If you stand behind the bad guy while he's doing horrible things, you just know you're gonna eat it in the end, and sure enough, he does. I'm kind of sympathetic about the whole "wanting Power Girl all to himself" thing though, gotta concede. Wink, wink. Still, dude, try flowers first! Or at least confidence. Chicks dig confidence. That's why she let Alex kiss her. The Spectre returns, triumphantly. I'm curious as to what larger role he'll play in the end. I hope this isn't just setup for outside continuity and instead has relation to the Infinite Crisis resolution. I'm betting it does. So far, Day of Vengeance and its iterations have had very little bearing on the plot, like Rann/Thanagar, whereas OMAC Project and Villains United were pretty integral. Whacking Star Sapphire? Ouch! I mean, yeah, she deserves some vengeance, but I mean, can't you put her in a jail or something? Destroying something that pretty, heck, even a vengeful God would have a problem with that. But hey, it indicates a decisive Spectre, which we haven't seen a lot of in a character in a while. Is Corrigan in charge? What role will he play? Bring on the series, DC! That intrigues me much more than Blue Beetle. And heck, get Rucka on that. That'd rule. Imagine Gotham Central meets The Spectre. That would RULE. When all of the heroes break out of the tower, it's kind of a foregone conclusion. You know they'll get out. But all at once? Attacking Alex from nowhere? Awesome. Good plotting, good execution, incredible beats. Especially with Power Girl in the lead, given her place in the plot from the last few months. Really, every single thing in this universe is resonating and relative. I cannot BELIEVE how well DC is keeping their continuity. It's the best I've ever seen it. Well, except Birthright. But @$#% Birthright. Much love, Mark Waid, you tell a good story, but continuity-wise? Oy. I have a moral beef here...I guess it's moot, given that Superboy is now dead, but there's an issue of him acting like Smallville Clark in this issue. He frees Black Adam. Then Black Adam murders Psycho Pirate. Did Psycho Pirate deserve it? Yes. Is it part of the hero code? No. Does Superboy know Black Adam is a homicidal vigilante? Yes. Did he unleash a homicidal vigilante? Yes. Does Superboy have responsibility for that vigilante killing Psycho Pirate? But with a caveat. If Superboy is responsible for what Psycho Pirate did, then Batman is certainly responsible for who the Joker kills. He made a snap decision in a time of need that resulted in a poor action. But he was NOT the agent. So I forgive it, especially since, yeah, it saved the Universe. Was it gritty? Yes. Was it overkill? I don't know. It's something Black Adam will do. Puritans will complain, but personally, I prefer a more graphic, honest depiction of death and pain in comics. Another great line, when Superboy says that magic "tickles". It's like Johns takes the corny, in-joke lines from Smallville and uses them in all the right ways. Awesome. I think Superboy's return was a bit pat. How does he get out of the Speed Force? I mean, Barry has trouble with it, and he has access to it. And there's a red sun in the Speed Force? I'm a bit confused by that. Still, he needed to come back, it makes for a great menace, and I'm glad he did. 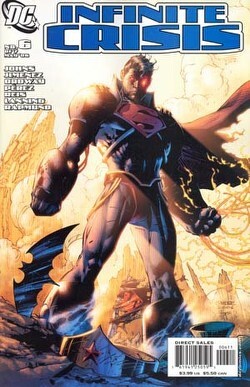 As an aside, the Anti-Monitor's armor, at least from behind, makes Superboy look a lot like battle suit Luthor. I don't think that's intentional, but I do find it a neat parallel. Batman and the Eye, sweat dripping from his face, redeeming himself and his error. Batman's sin? Not trusting others. Brother Eye points it out, and Batman reveals that he's not like his old self, trying to take down the Eye on his own. Instead, he's making Brother Eye, who only knows the old Batman, think that, while the other characters help redeem him, culminating in fixing things with Lantern, who saves him, and destroying his sin in the process, if you will. Epic. Superboy slams into the evil Superboy, ROUND TWO. Now THERE is a reason for a splash. It's odd to me (but still, not a bad thing) that the two Supermen fighting weren't so exciting, necessarily, but the two Superboy fights, start to finish, were incredible, gut-wrenching, and truly perilous. I think he gets the better treatment because he bites it in the end, and justifiably so. Blue Beetle was never so vital to me as he was when he stepped up, did his heroic duty, and died in the line of what he did. Same with Conner. That's why I'm not mad that he's dead. His character has lived, evolved, had a natural arc, and the only place for him to go from here was to become the new Superman (never going to happen) or die. And he died. And he died well. I have no problems with this, even though I am beloved of his character and it makes me sad. It speaks to my age as a comic geek, that I' ve been around long enough for a character to be born, have an entire vivid character arc, and then die. That's just incredible to me, odd to think. He speaks of people forgetting him, and that's a worry for me. The continuity fractures at the end of the story imply that something is going to happen with Zod, with the JLA origin, with Batman and Joe Chill, and most intriguingly, the return of the regular Superboy. Where and how? We don't know. Do I want a Superboy in Smallville? Am I ready for that? The short answer is that I'm very, very dubious. But the long answer will come when I see the first comics set in that universe, provided it's not obliterated by the Siegel court ruling. Superboy's death just killed me. It did. It's the most powerful, hurtful, epic, and sad moment of the whole thing. I think what got me, what almost made me cry, which I never do (even though my tears have healing properties), is the fact that if you look at the page, you see, Conner's lost his hand. He's got pieces of metal through his leg, and the other is twisted out from under him. Cassie weeps over his body, and the other heroes, surrounding him, move in, realizing that for all their power, they' re all too late. But that, graphic and horrid as it is, isn't what got me. What got me, what made me actually hitch, was looking up, after staring at the focal point for almost a full minute, and seeing the expression on Superman's face of utter horror and sorrow. Of hearing his scream through the page, even without a bubble. That, that was just horrible. And that's why this is a five. That is powerful storytelling. Nick: Art - 4: Again, the first time I haven't given a five for the art in Infinite Crisis. The reason really isn't the quality of each page, most of them were great. But just look at how many artists worked on this book. We've still got four people doing pencils. I'll accept that. But look at the inkers. We have no less than ten people working on inks and finishes. TEN. On one issue. DC has been planning this story for the better part of three years, they shouldn't need to cram this many artists on the book just to finish it up. I'm fine with using the different pencillers to give different feels (Ordway on Earth-Two, etc) but the different inkers just distract from the continuity of the comic. I will still give credit where credit is due. The scenes from all of the different Earths were fantastic, and all of the scenes in the satellite (by Reis I believe) were beautiful. That man should be on Batman (although his Green Lantern is great too, and he is on that book, so I shouldn't complain). That Spectre scene that I already don't like didn't do any better in the art department. I can't put my finger on it, but it just looks wrong. A few other panels stood out. Power Girl charging Alex was cool, and my favorite scene with Black Adam and Psycho Pirate was wonderfully well done. I also really liked the effect that was used for the convergence of all of the Earths. It was more computer effect than anything, but it looked great. Finally, the conclusion page was probably my favorite. Jimenez did a fantastic job of capturing the moment. My only complaint about it is that I really don't feel that E2 Superman should be there. Without him, you have a very nice image of the big three and their successors. Neal: Art - 5: If you had told me, ever, at any point in my some 375 articles for this site, that I would look at a book with twelve different artists for thirty pages and say that it was consistent, very well illustrated, and beautiful, I'd say twist my vas, I'm done. But I'm saying it. This book continues to maintain its high quality of art and structure, blowing me away. A personal favorite moment was the attack on Brother Eye, but that final page wouldn't be half what it was if they hadn't conveyed Superman's expression PERFECTLY. Nick: Cover Art - 5: Fantastic covers from both of the artists this time around. Perez's cover fit the issue very well, and it was great going through all of the shards and trying to figure out who everyone is, and it definitely deserves a five. But the true star this month is the Lee cover. Superboy-Prime looks fantastic. Everything about this image is perfect. The pencils are perfect, but the coloring and inking really add to the shot. All of the little touches really made it for me, with the batarang, lasso, and lantern scattered around him. My favorite touch though, is the Superman cape in the background, because it isn't actually the cape. It's Superboy's t-shirt. It was great to see Conner get his own 'tattered costume on a pole' moment just like Superman did years ago. Beautiful covers from both. Neal: Cover Art - 5: I got the Jim Lee one. It's symbolic of what happens in the issue, but it's not exactly something that happened, but the image is so crazy good you just don't care. Looking at it, I'll bet it probably ticked some people off, because it gives away the ending. Had I looked closer, I might actually have gotten it myself. It shows the Superboy shirt in the "Death of Superman" pose, which is a dead giveaway. Good symbolism.